Picture 1: Janet Huber, Caroline McMinn & Sandy Symons Picture 2: (Back Row) Janet Huber, Sandy Symons, Colleen Schneiter, Nancy Hall, Corrine Schneiter, (F) Muriel Brown, Avril Howald, Caroline McMinn and Connie Edwards. Picture 3: Our Sisters from Iowa (Back) Colleen Schneiter, Connie Edwards, (F) Nancy Hall and Corrine Schneiter. On Wednesday May 15, 2014 members from both Amethyst Lodge # 49 and Welcome Temple # 7 gathered at the Prince Arthur Hotel for a lovely dinner and social. Attending from out of town were Sisters from Iowa: Connie Edwards - Supreme Secretary, Nancy Hall - Supreme Junior, Colleen Schneiter - PSR and Corrine Schneiter - PSR. Connie, Colleen and Corrine are members of our Temple. Following the meal we surprised Avril Howald with a birthday which was delicious. 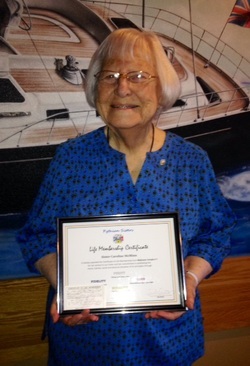 Following dessert Sandy surprised PGR Caroline McMinn and presented her a Life Membership Certificate, a pin and card. Welcome Temple # 7 honoured Caroline for her outstanding service to our Order and her commitment in promoting the moral, mental, social and physical elevation of its principles through Purity, Love, Equality and Fidelity. Caroline turned 91 on April 21st and is most deserving of this honour. PGR Caroline McMinn escorted by Roy Lamore. Caroline McMinn has had the honour of laying the first wreath on behalf of Silver Cross Mothers during the annual Remembrance Day ceremonies at the Waverly Park Cenotaph in November for many years. Caroline lost her husband Alvin Boyer when he was killed in Italy during WWII. She called her role as a Silver Cross Mother a "sad honour". On one hand she relishes it, but on the other, she wishes she didn't qualify. Welcome Temple # 7 continues to support the Thunder Bay Special Olympics. Welcome Temple # 7 continues to financially support local charities in Thunder Bay. In 2013 we donated over $500.00 to each of the following charities: Canadian Kidney Foundation, Thunder Bay Special Olympics and the Salvation Army (Soup Van). In the preceding 15 years, we have donated over $27,000.00 to the following charities: Alzheimer Society, Arthritis Society, BISNO, Camp Quality, Canadian Cancer Society, Canadian Mental Health, Canadian Diabetes, Christmas Cheer, Claude Garton Home & School, CNIB, CP, Cystic Fibrosis, Diabetes Network, Heart and Stroke, Kidney Foundation, Knoxx United, Lakehead Association for Community Living, Lung Association, MS, Special Olympics, Northern Cancer Research, Roseview Manor, Thunder Bay Regional Health Science Centre, Salvation Army, Shelter House, St. Andrew's and St. Joseph's Hospital. Our involvement in our community does not end with just the monetary donations. Countless hours of volunteering are done throughout our community each year by our members. We do canvassing, make phone calls, work at charity bingos, volunteer at the local hospitals and community centres, visit with the elderly, help out with food drives, at sporting events and have even stuffed envelopes. From August 2008 - August 2010 alone over 20,000 hours were recorded. Every member of Welcome Temple # 7 was recognized by then Supreme Chief Sheila Stooksberry with a Certificate of Appreciation for their efforts. From August 2014 - August 214 our members and Temple were recognized by Supreme Chief Sandra Symons by a Certification of Appreciation for our volunteering efforts we have made in our community. We did make a difference together! We are always eager to help in any way when called upon to do so. We are always looking at increasing our membership and our involvement in our community. ​Why not join us - you are more than Welcome!